Need a hand? Severed Groundbreaker Zombie Hand offers an extra helping severed hand when needed, although it is help that anyone should be cautious of. The last thing anyone wants is a Thing inspired left-hand to turn into a hungry killer zombie. Decomposed rotting look icy death blue and purple color zombie hand appears to rise out of the ground to get you! Its fingers stretch up towards the sky as it struggles to free itself, while the ground splits to accommodate the rising zombie arm. Place this prop next to a novelty tombstone, or as a table centerpiece for your next fiendish feast! Ghoulish indoor outdoor decoration is made from hollow blow-molded plastic, approx 11-inch (27.5cm) tall. Groundbreaking base approx 5.5-inch (13.75cm) diameter. 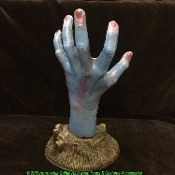 Zombie Hand from the Ground is a fiendish way to make your lawn or yard haunt look like ground zero of the next zombie outbreak!